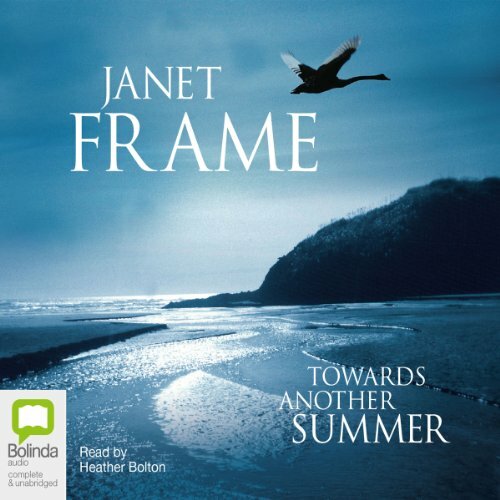 When Janet Frame died in 2004 at the age of 79, the world lost an underappreciated novelist but gained Towards Another Summer, presented here as an audiobook performed by Heather Bolton in a no-frills New Zealand accent befitting the prose. Written in 1963, the novel was not released during Frame’s lifetime most likely because she considered it too personal. The simple story follows one female writer to a country house to spend a weekend with a journalist and his wife. Frame spares the listener a country farce and treats the listener to a meditation on interiority, longing, and relation. This audiobook is recommended listening for a long, reflective journey. Towards Another Summer is a meditation on the themes of exile and return, homesickness and not knowing where home really is. It is suffused with beauty and tenderness and shot through with self-deprecating humour and frailty. Grace, the protagonist, is taking a break from writing a long novel and seems to be losing her grip on daily life in London. She feels more and more like a migratory bird as the pull of her native New Zealand makes life in England seem transitory. The desire to leave behind the social human agonies of appearing neither too clever nor too stupid, too helpful or too lazy, becomes overwhelming for Grace. Frame's observational prowess is apparent in Towards Another Summer in the vivid and heartbreaking passages about children and childhood and in Grace's growing awareness of the demanding forces of social convention. Heather Bolton is a genius! Besides the book being amazing and I've listened to it dozens of times, Heather Bolton turns it into a brilliant performance. Truly remarkable.